Got an outdoors man or woman in your family? The My Fly Rod is the ultimate gift. Pack this fishing rod fly swatter with all your other gear and you'll be ready for whatever nature throws at you. It looks just like a casting rod but instead of hooking fish, you'll be eliminating pesky flies, even the big horse flies are no match for this "fly rod." 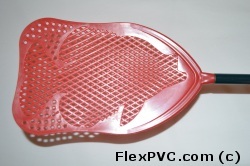 In fact this is the last fly swatter you will ever buy. Made with a real graphite rod, just like real thing with an ultra comfortable cushioned grip and oversize head you can't miss! Comes in Red, Blue or Yellow. We have used these swatters for 4 years and they are still in remarkable shape. No more heads flying off, no more broken handles, no more bent wires. Best of all no more flies! Makes a great gift! Special price just for Christmas.